Stop and Smell: A Charlie Guest Post. When we go on our daily walk, Mom talks about and enjoys a lot of the smells this time of year. She oogles and googles and swoons about the lilacs and the wild honeysuckle and even freshly mowed grass. I would rather smell my friends. 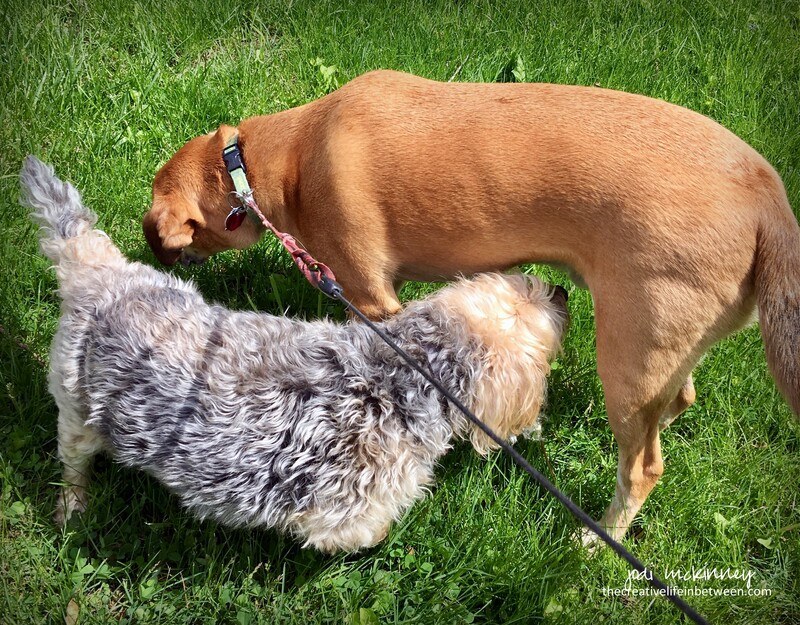 Yep – I like to stop and smell my friends. This is my friend, Oliver. He is one of my buddies, and this is how we greet each other. But Oliver doesn’t seem to mind. And besides… he does it too. I know they say a dog is a (wo)man’s best friend, but sometimes we just don’t see eye to eye! Or should I say we don’t smell nose to nose? Charlie is an adopted dog with brown eyes and a white-tipped tail who brings joy and laughter to his family and friends. Charlie is a gifted writer, raving food critic, cat, chipmunk, and donut lover, and exceptionally photogenic model. Some of his best friends are Mike the UPS Man, Cliff the Mailman, Jager the neighbor dog, and ANYONE who delivers pizza to the house. If you would like to read more guest posts by Charlie, simply type “Charlie” into the Search box at the top right hand corner of this link: thecreativelifeinbetween.com. If you would enjoy a companion like Charlie, please consider pet adoption. So cute and such a pleasant post to read Jodi. Dogs are really like that and the picture says it all. LOL! Sorry Charlie, I am with your Mom on this one. I love the smell of lilacs and honesysuckle! AHH!! But hey you do what makes you happy Charlie! 🙂 Have a great Tail-wagging day! Wow so many great firends Charlie! Good morning Charlie! It is so good to see you again. Dogs find out about each other by smelling. Ya’ll have different communication styles than humans and sometimes humans don’t understand that. I have missed my sweet Bria so much that I got a puppy. Her name is Sugar. I will be doing a post on her soon. Have a wonderful day Charlie!! She’s a a little pistol! LOL! I think I should have had my head examined before I got a puppy! flowers/dogs, tomato/toe-ma-toe, one man’s caviar is another man’s fish bait…Have fun Charlie! This is a wondrous time of year to stop and smell whats in the spring air, Charlie. I can understand how your mom feels. Enjoy. I love your Charlie posts, but I have a question which has to do with baking—not Charlie. Sorry Charlie!!! When you made your cookies far ahead for the wedding, how did you do the freezing to make sure they retained their freshness? Hi Gail. I put them in Rubbermaid plastic containers and/or ziploc bags. Works like a charm. Just keep the air off them and freeze as soon as they are cool while fresh.